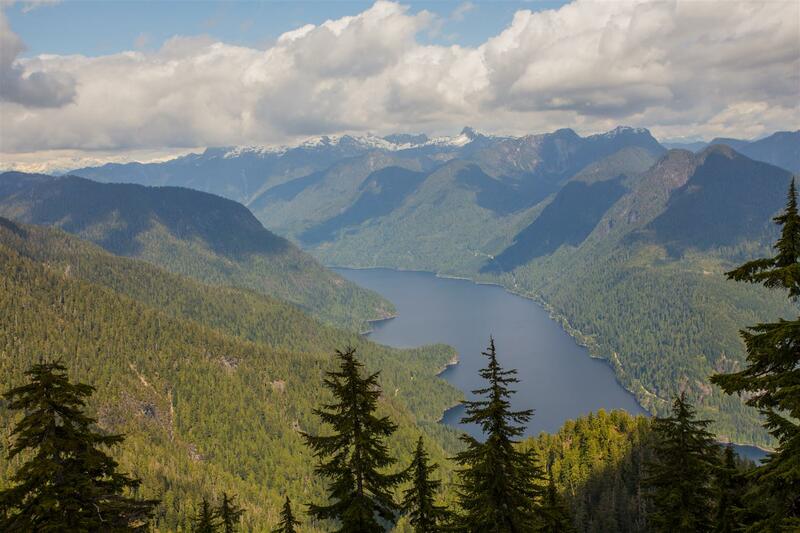 This is the general hiking page for Buntzen Lake Hikes. 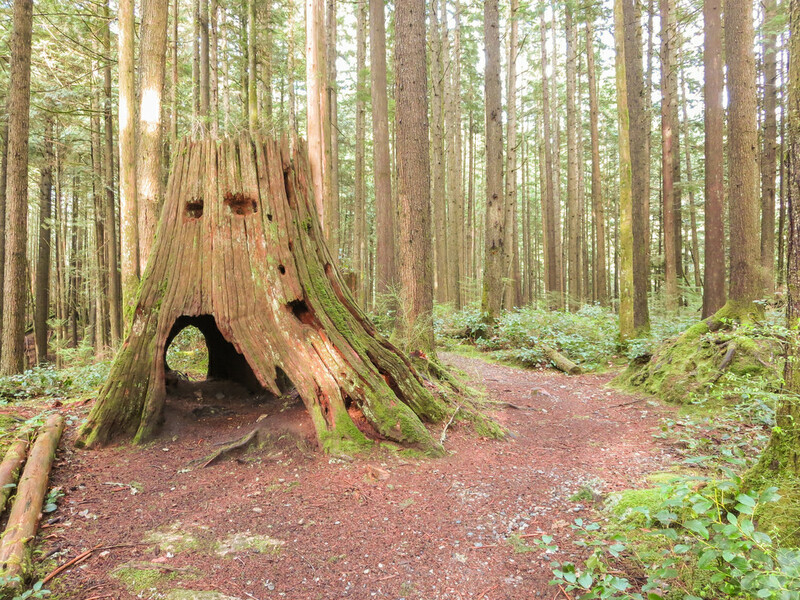 Check out the “Buntzen Lake Hikes” tab for more detailed info, photos and more hiking trails. 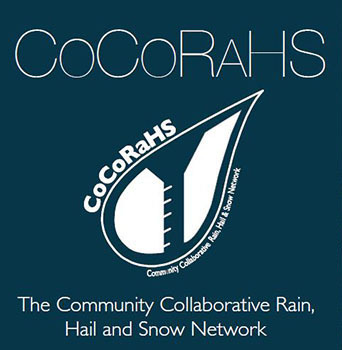 FOLLOW THIS LINK FOR MORE INFO ON THIS HIKE. 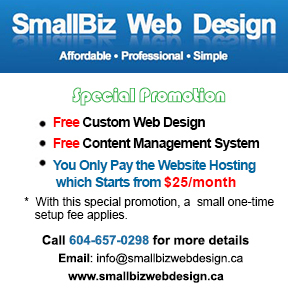 Circle Buntzen Lake and enjoy the beautiful views of the lake and surrounding mountains. Starting at Buntzen Creek Bridge at the east side of South Beach, the trail leads north, passing several lake access points and viewpoints. After a 20 m section on Powerhouse Road, the Buntzen Lake Trail continues down to the North Beach picnic area. From here, cross the suspension bridge to continue along the Buntzen Lake Trail or you can return on the same path for a shorter, easier hike. After crossing the suspension bridge, the trail takes you through open areas underneath the powerline, through mature forest, across several bridges, then finally opens up onto Pumphouse Road; follow this road south to the floating bridge at the southwest arm of Buntzen Lake, cross the bridge and follow the trail back to South Beach. This route is recommended for experienced and fit hikers only. Spanish for “ten views”, the Diez Vistas Trail is aptly named. Offering spectacular views of Burrard Inlet, Indian Arm, the North Shore Mountains and Eagle Ridge, the Diez Vistas Trail commences just across Powerhouse Road from the old floating bridge – The bridge is mostly a land bridge now. After crossing the lake, you’ll go straight across Pumphouse Road and this is where the climb begins. Travelling uphill into the forest, eventually you will cross the powerline and pipeline and continue along a series of switchbacks until you reach the first viewpoint (which is not an official vista !). 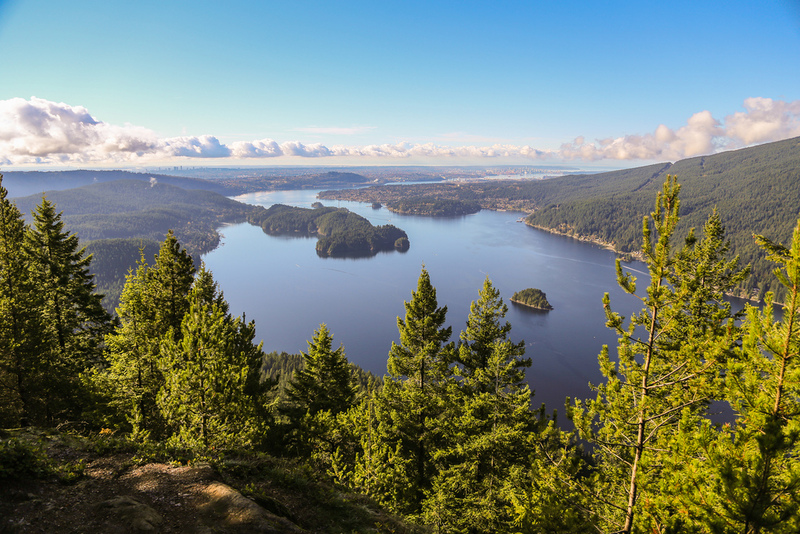 After this viewpoint – you can choose the east loop, which takes you to views of Belcarra, Sasamat, Eagle Ridge and Buntzen Lake or you can take the left route and bypass those viewpoints. If you take the east loop, just head back about 5 m or so from the viewpoint and find the marked trail. After reaching the high point where the trails reunite, you travel along a forest trail that takes you to a number of viewpoints (some of the original viewpoints are obscured by trees). Eventually, the trail terminates at a BC Hydro service road, where you’ll take a right and follow the service road for about 250 m and take another right onto the Old Buntzen Lake Trail which takes you back to the Buntzen Lake Trail. Once connected to the Buntzen Lake Trail, take a left turn and follow the trail over the suspension bridge leading to North Beach. From here, follow either Powerhouse Road or the Buntzen Lake Trail back to South Beach. This hike is an alternate route to traverse the west side of Buntzen Lake; it’s a little longer and hillier and there are far fewer people on this trail. The trail starts at the north end of Pumphouse Road – it’s the left route option. This trail is a multi-use trail, which includes Equestrians and mountain bikes. Near the north end of this trail, there is a great viewpoint – SEE HERE. This route is recommended for experienced and fit hikers only. The trail to Lindsay Lake is the most popular of the three loops along this trail. Climb to El Paso Junction, then turn left and cross Buntzen Creek. 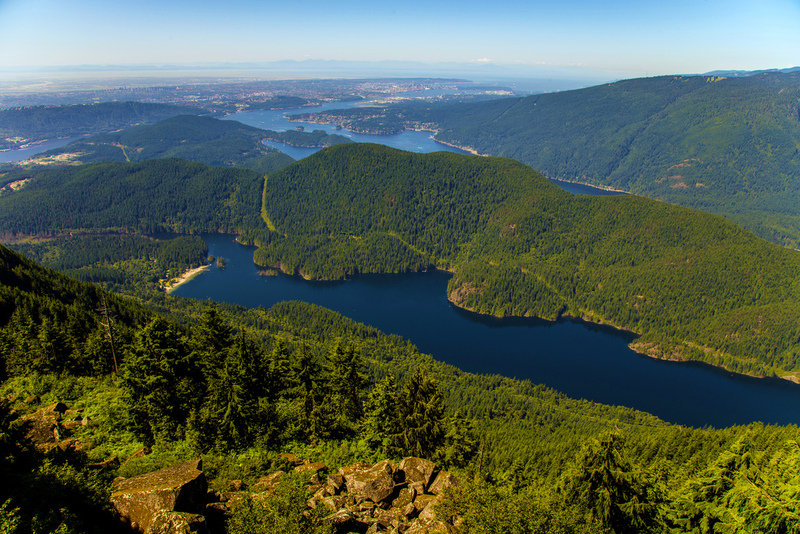 Passing through the ancient mountain forest you will encounter several spectacular viewpoints overlooking Vancouver. At Lindsay Lake Junction (at the north end of Lindsay Lake) turn right and head south through the “lakes district” back to El Paso Junction. Return to the main parking area along the same trail you started on. This route is recommended for experienced and fit hikers only. It is very steep in places. Follow the trail to El Paso Junction, and then choose either the left or right trail to Lindsay Lake Junction. If you choose left, you will see Eagle Ridge’s best remaining old-growth forest as well as passing several viewpoints of Vancouver. A right turn will take you through the “lakes district” with its many beautiful tarns. Continuing north from Lindsay Lake Junction, ascend Mt. Beautiful (Eagle Peak) for a panoramic view of Mt. Baker, Vancouver Island, the Fraser Valley, Coquitlam watershed, Mt. Seymour Park, Indian Arm and beyond. At Swan Falls Junction turn left and follow the steep (and sometimes slippery) trail down to Powerhouse Road, which then leads you back to South Beach. This route is recommended for experienced and fit hikers only. The Dilly Dally Loop? Don’t believe it! Dilly dally along this trail and you’ll be spending the night. If you’re up for it, you are rewarded with spectacular views as you travel through high mountain forests. Be sure you have the whole day and note gate closure times. Follow the directions for the Swan Falls Loop to Swan Falls Junction. Continue north along the ridge to Dilly Dally Peak, then follow the trail and access road back down to Powerhouse Road. 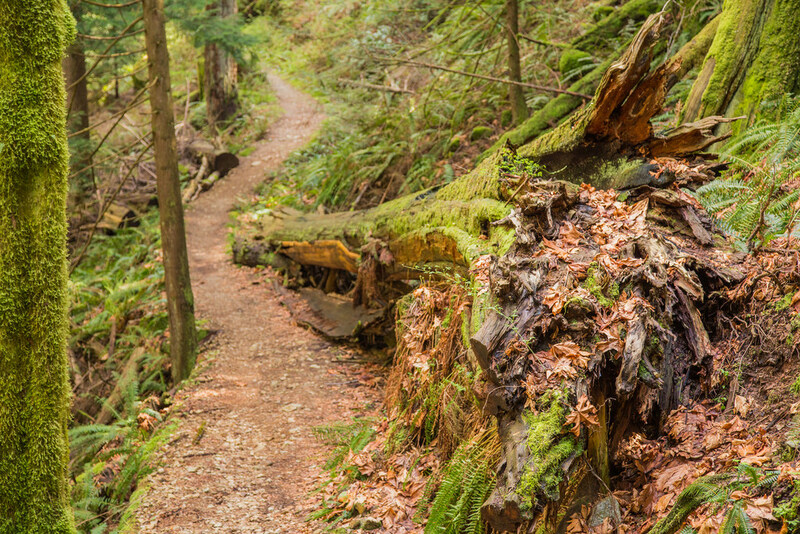 Looping around the forested knoll southwest of South Beach, this trail passes through a variety of forest landscapes and past nice views of Buntzen Lake. Look for interpretive displays along the way. This is a great trail for those that don’t do much hiking or are just getting into hiking. The trail is also great for schoolchildren, with all the interpretive displays. Hiking time: 2-2.5 hours (one way). Distance: 4 km. Elevation gain: 100 m.
The Academy Trail begins at the main entrance gate and extends north through a fern-filled forest paralleling the main access road to the equestrian parking lot. The trail then follows Rogue Creek to an open transmission line access road that joins with Powerhouse Road about halfway to North Beach. Hiking time: 45 minutes (one way). Distance: 1.5 km. Elevation gain: 20 m.
Before the suspension bridge was built, this trail portion completed the loop around Buntzen Lake. Follow the transmission line north where it leaves the Buntzen Lake Trail. This leads you to a concrete water intake building. Here the trail cuts through the forest, joining Powerhouse Road immediately northwest of the dam. Originally constructed and maintained for equestrian use, most of the following trails are open to hikers and mountain bikers as well. Some sections of these routes were constructed as trails, while other portions follow old logging road tracks and powerline rights-of-way. Mountain bikers are permitted on access roads, transmission line roads, the short trails linking the two parking areas with the floating bridge and on the trails to Sasamat Lake and Eagle Bluff. Mountain bikers are requested to obey all posted signs. 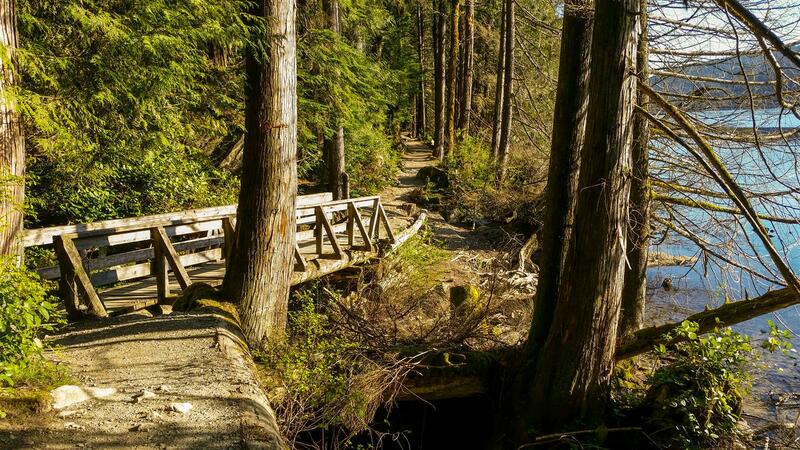 Leading steeply up the mountainside into the cool, dark cedar and hemlock forests that blanket the slopes around Buntzen Lake, these trails form loops with Powerhouse Road and the Lakeview Trail and provide access to the Diez Vistas Trail and the trail to Sasamat Lake.